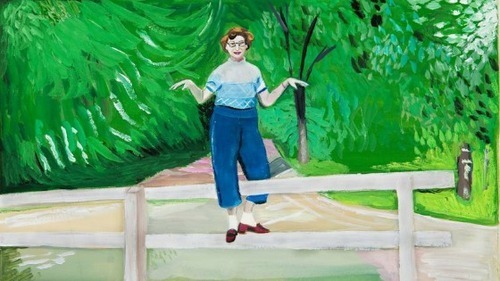 MoMA has begun a series of collaborative books with Girls Standing on Lawns. 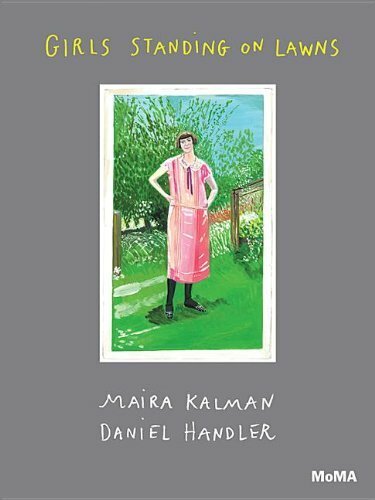 Author Daniel Handler and author/illustrator Maira Kalman searched through MoMA’s extensive collection of photography archives and compiled a group of photographs, most by unknown photographers, and have compiled them in this slim but thought-provoking volume. The photographs are interspersed with original paintings by Kalman and text by Handler that leave readers to ponder one of life’s most common and innocuous acts, photographing a woman standing on a lawn. All of this is accomplished in a mere 40 sentences. It is no secret that there are stories hidden within each photograph and part of the wisdom of this book is to avoid writing text that dictates what readers should be pulling from the photographs. Instead the text encourages readers to dig into the innumerable possibilities of the lives and thoughts of the women featured in the photographs as well as the motive and intention of the person snapping the pictures. The book concludes with author and publisher notes which help readers to understand the intent and import of the project. Included in the notes is the definition of the kind of photography used in the volume; vernacular photography. This book would make a fabulous tool for writing teachers to encourage students to create fictional tales of the women featured. It could be used in a photography or art class as an example of how art can be compiled to tell another story by the way that it is combined. It could be used to study the history of American fashion, trends and photography from 1910-1950. In short, this book is a lovely, thoughtful and brief read that has the potential of opening one’s eyes to seeing the mundane in a new, more beautiful light.